If you enjoy roguelike titles then one combined with the fun of deck-building might peak your interest. Developer Blaster’s Steam Early Access title, Destiny or Fate, is the combination of these two genres. 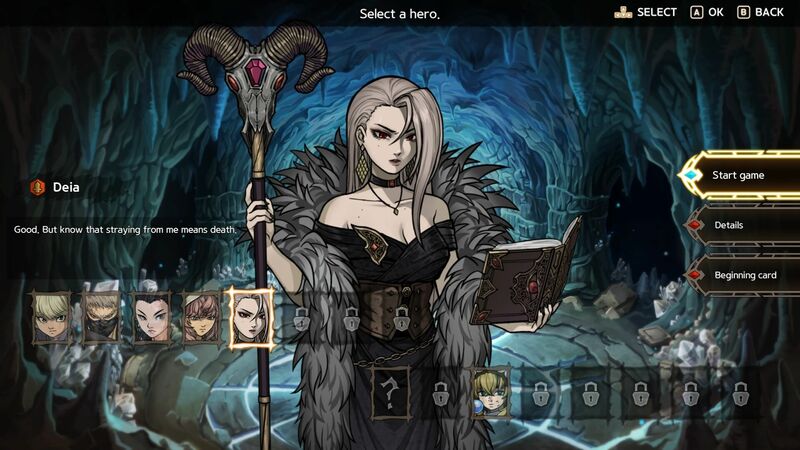 Set within a fantasy world this roguelike deck-building adventure has plenty to get excited about. Although the mix of two genres might not roll of the tongue, Destiny or Fate does deliver on this promise. Featuring over 150 cards along with plenty of challenges systems to master. Players will need to be patient, resourceful, and skilled if they want to succeed. Being a roguelike, the adventure won’t be easy and should you fail on the way then expect to lose everything. Each attempt at overcoming the monsters and bosses that await will start with needing to pick a hero. There are fifteen available in the current release, which you unlock in next to no time, each offering a unique play style. Each of these come with their own strengths and weakness and also have a different set of starting cards. Becoming familiar with this information will aid in how you develop your strategy for a given run. Should you prepare well and luck is on your side then you might succeed. Navigating the world map is achieved by moving from one node to another, with each node offering something different. This could, for instance, be a shop to upgrade your characters or buy new cards. Maybe instead it gives the chance to summon a new hero, or even trigger a fight with deadly monsters. With enough progress the boss node will appear marking the start of the real challenge. While battles are straightforward there is a steep learning curve to becoming familiar with the rules of combat. 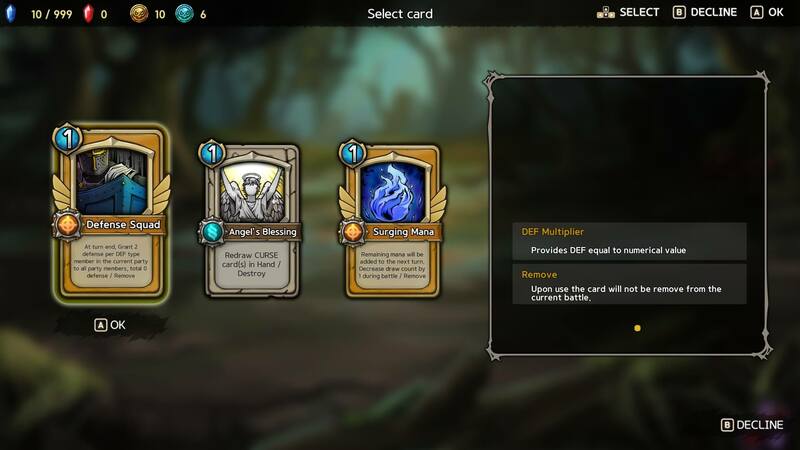 Each card has a different cost to play and will perform a different action. Reduce the enemy’s health to zero while staying alive yourself and victory is yours. The level of strategy here runs very deep, with plenty of complex mechanics in the work at any given time. Unfortunately, Destiny or Fate’s lacking tutorials fails to explain many of these systems. One such aspect which could be explained better is the capturing of enemies. When you win a battle you may pick one of the monsters you fought to join your team. If they die then they are gone for good, but while they are present they act as another line of defense to your hero. While they are unable to attack directly, they can use their special move — when charged — to help turn the tide in battle. The system is easy to understand once you have used it a few times, but having the tutorial explain it right off the bat would of helped. Once you have overcome the struggle of the rules, and the difficulty of encounters, you’ll find a lot to like within Destiny or Fate. For starters, the core gameplay loop is refreshing and although it is exhausting at times the challenge is a compelling one. Building the perfect deck to work with your hero and the monsters you have captured along the way is exciting even with slow progress. Then you have the beautiful artwork of the characters, monsters, and background — all of which is a treat to see in motion. The current build of the title is also very polished with no real issues taking away from the experience. The keyboard controls could do with some improvements but the option to play using the mouse resolves this. Quality of life improvements are sure to come in future too as the title receives more updates. In its current state Destiny or Fate is a polished, if somewhat unforgiving, experience that is definitely worth checking out. With plans to add more heroes, cards, and monsters in the future, there is plenty to look forward to. The developers also state they will be tweaking the difficulty of the experience too, which is good to hear. A roguelike deck-building video game might not be the first thing you think of but it definitely shouldn’t be one that you overlook. Destiny or Fate is available now in Steam Early Access for PC, Mac and Linux.